Composer and pianist Kathy Raimey offers not just a solo piano album, but a recording filled with ambient tracks that include electronica, voices and ethnic instruments. Put it all together and you get a sound that is out of the ordinary, inspiring and very entertaining. It is Always Now has music that is quietly beautiful, soulful and always emotional. I compare her to Suzanne Ciani or perhaps Doucet. I found the title of the album It Is Always Now a bit ambivalent, but that is how my mind works. First I thought, yes... everything is urgent. Take care of it now. Then I realized that perhaps life could be enjoyed in the now. Now that makes more sense. You can tell right away that this is an album of cryptic titles chock full of ambiguities. The recording opens with the track Sustainable Space. It has a twinkling sound that washes over a string background. You feel that the space is right in the middle of your own mind and that with music such as this, dreams are possible. Quiet Rain is exactly what it says. An unexpected mild February day where the clouds turned to mottled gray blankets, the wind spoke like a hushed human presence and the rain came down like tears from the gods. They wept not from despair, but a peaceful joy for the coming of spring and all the promise that it holds for mortal man. Soon there would be life renewed. Green and spiritual. This is definitely my favorite on the CD. One of the lightest tunes on the CD is called Riverbend. I listened to this one several times until I realized that the song flows and sweetly whispers about the undiscovered that is about to be. Like the road less traveled, the unbeaten path or the surprise around the corner, it is the unexpected that keeps everything from being humdrum in our lives. One line from a William Faulkner story comes to mind, "It is time to say good-bye to the things you know and hello to the things you don’t know." Illumination was surprisingly industrial in nature. It featured metallic thunks, Tibetan gong-like percussion and a wafting, high-pitched melody. If we think of something illuminated then it must be in the spotlight. Or is it enlightenment of a different color? The song to me was discordant at times, but it grew on me. You cannot find harmony without understanding discord. Kathy’s way of opening her heart to the music and to the listeners is called Soliloquy. Her echoing piano is almost lugubrious as it sings the hopes for the successful marriage of life and music. 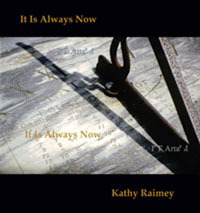 Kathy’s voice introduces the title track with the refrain It Is Always Now. Layers of echoing voice and a strong, urban beat fractures the lull in your head. The nightclub excitement is strong as is the repetition that the moment is at hand. It is certainly not my favorite cut, but the album has so much to offer that something atypical is considered refreshing. The album is a bit of an emotional or perhaps, a musical roller coaster. The variety is a tribute to not only Raimey's compositional talents, but to her production prowess. The blends of subjects and instruments make the album stand out against many other piano works that are truly homogenous.